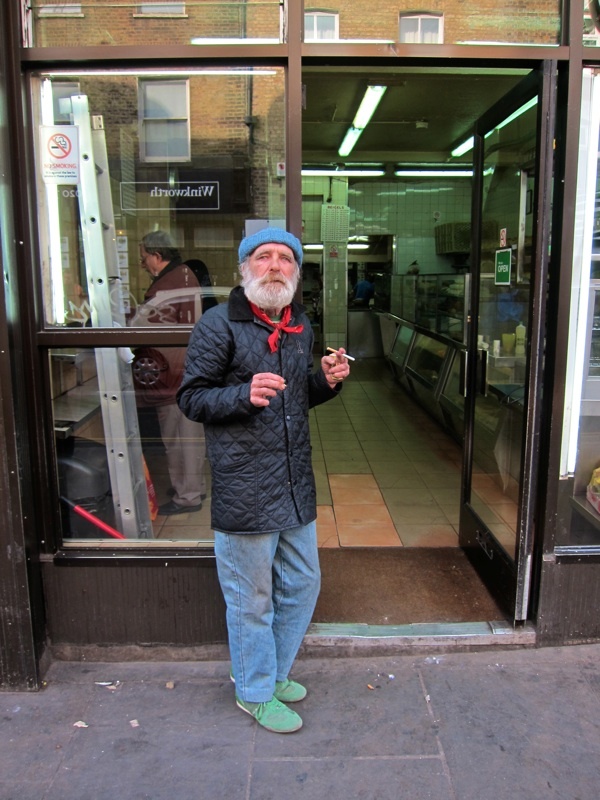 Almost every day, I exchange greetings with Mick Taylor who has been sitting outside the Beigel Bakery – off and on – for nearly fifty years. 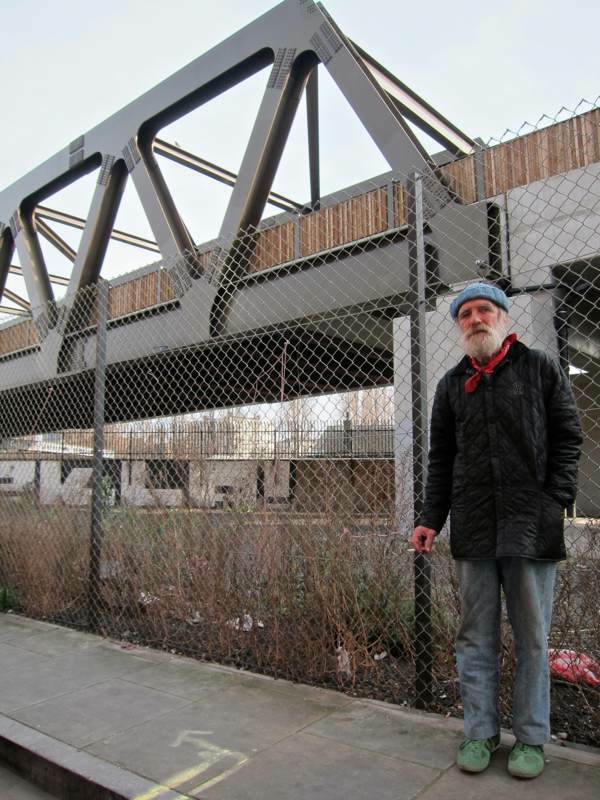 Over all this time, Mick has become famous for his personal style, emerging as a star player in the street life that he loves so much, celebrated as the Sartorialist of Brick Lane. Leaving the environs of the Beigel Bakery which is Mick’s customary habitat, one afternoon, we turned left just before the railway bridge into Grimsby St where the newly constructed East London Line bridge of steel girders has replaced the shabby nineteenth century railway arches that stood here until recently. “You could find old things in the street and bring them down here and sell them, and people would always buy them and that way you were never without anything.” Mick assured me, casting his eyes affectionately over this former source of livelihood and screwing up his eyes in bewilderment as if somehow he could conjure it back into existence my focussing his attention. “They used to call me Mick the Finder.” he said, as we walked on. Round the corner in Cheshire St, we paused outside the squat brick building that is Blackman’s, where the redoubtable Lee Knight sold shoes for years at rock bottom prices in a business continued now by his son Phil. This is a location of pleasure for Mick. He told me his beloved Gran bought him the pair of Italian pointed black shoes with cuban heels here, that he wanted for his seventh birthday, at a cost of two pounds, two shillings and sixpence. “My mother had twelve sons and two daughters, she didn’t have time to take care of us, she was too busy trying to find a husband,” he revealed, raising his eyebrows humorously, in partial explanation of why he came to be brought up by his grandparents. Walking back up the Lane towards the Beigel Bakery, Mick ruminated over the journey, thinking out loud, “It’s good that the young people are coming in and bringing money,” he suggested to me, “but I don’t think they care very much about the people who are here, they’re a bit selfish in that way.” And then he qualified the thought quickly, lest I think him ungenerous “People always treat me with respect and say nice things, they’re polite to me.” he confirmed with a weary smile. Both our energies were flagging now after this emotional odyssey through space and time, and we made for the nearest cafe to seek a perspective. “I haven’t had a walk like that in a long while, I think it’s done me good.” Mick concluded thoughtfully as we sat down together. 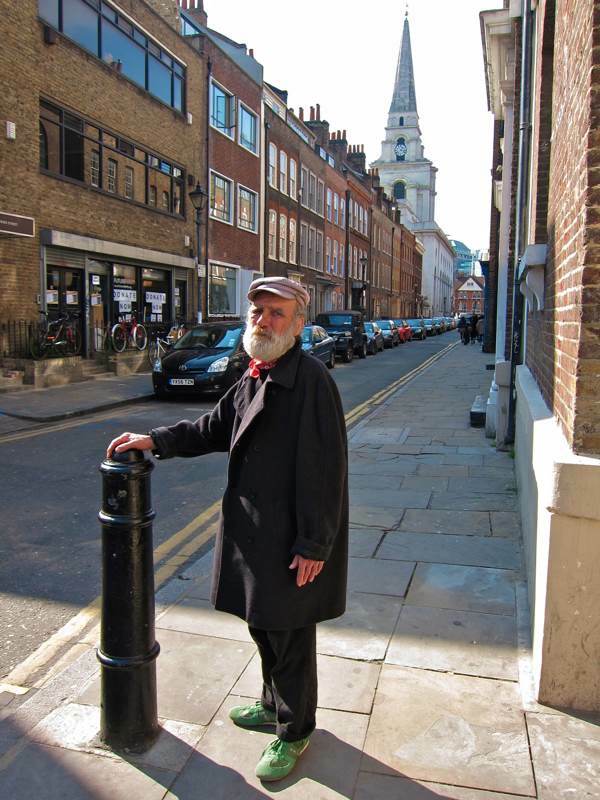 In his usual spot outside Brick Lane Beigel Bakery. 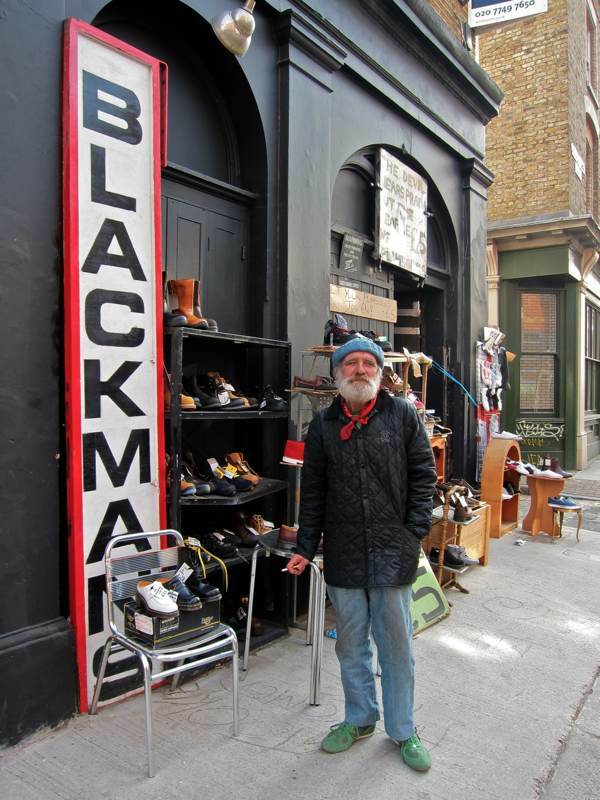 At Blackman’s, Cheshire St – where Mick’s Gran bought him the pair of Italian pointed black shoes with Cuban heels that he wanted for his seventh birthday, at a cost of two pounds, two shillings and sixpence. 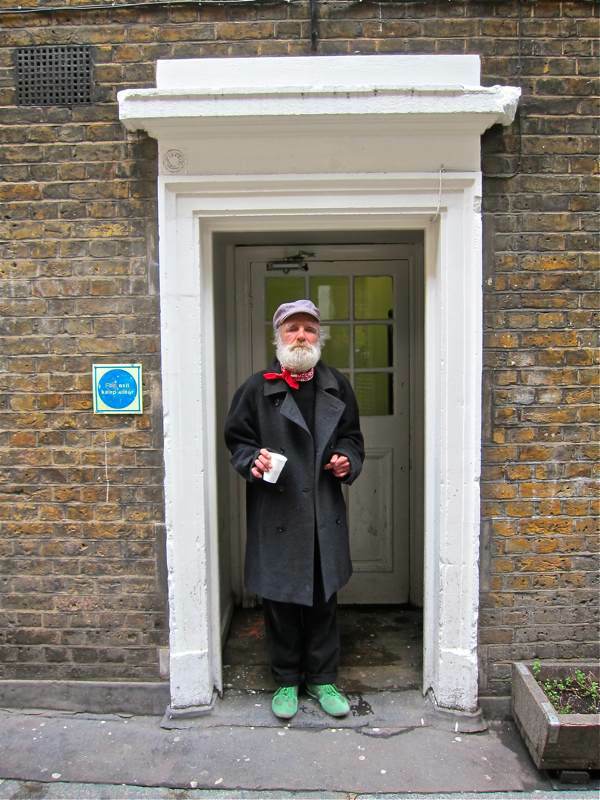 At Dray Walk, Truman Brewery – the doorway where Mick clocked in each morning and enjoyed two or three pints of maturing brown ale with his workmates at eight in the morning before commencing work. ‘……………. enjoyed two or three pints of maturing brown ale with his workmates at eight in the morning before commencing work’. We see that in France still – well, maybe a beaker of wine or something stronger in a local bar. Hard to remember that it was a useful source of calories before a hard day’s work, rather than the sign of something rather more worrying. Thanks for the walk, Mick! barrels, hogsheads, firkins and crates. i’m sure i’ve mentioned this before but the songlines/walking routes of a city really kind of are its true architecture. there’s a wonderful book by deborah parsons called Streetwalking the Metropolis, about women walking through the city — Doris Lessing, Virginia Woolf, Amy Levy through london. i think this is the first example i’ve seen of walking a city with a street person, as opposed to the rather elitist walter benjamin idea of the flaneur. thank you very much, and best regards to mick from a friend in new mexico. 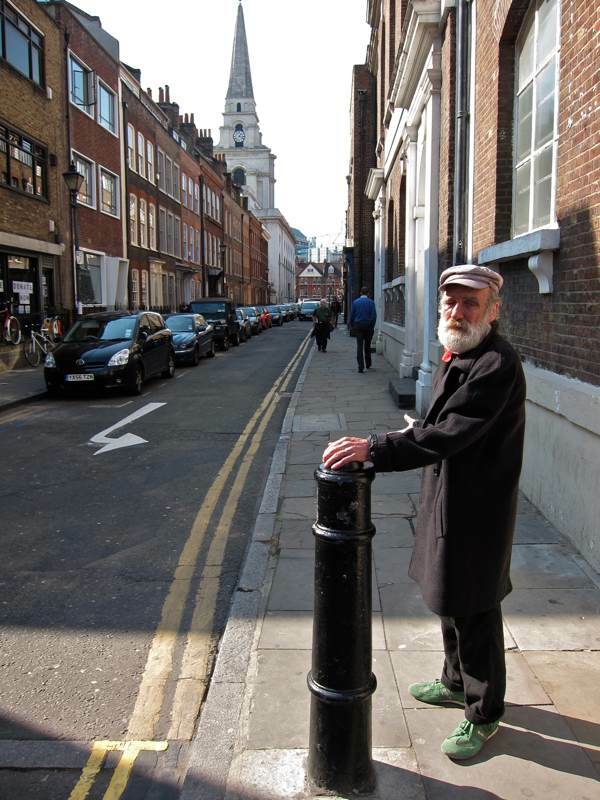 I’m enjoying your Spitalfield stories! My great-great grandparents lived near the Market for a while in the 1830′s and one of their children was baptised in the church in the background of this photo. I visited it for the first time last year. I enjoyed this walk very much. 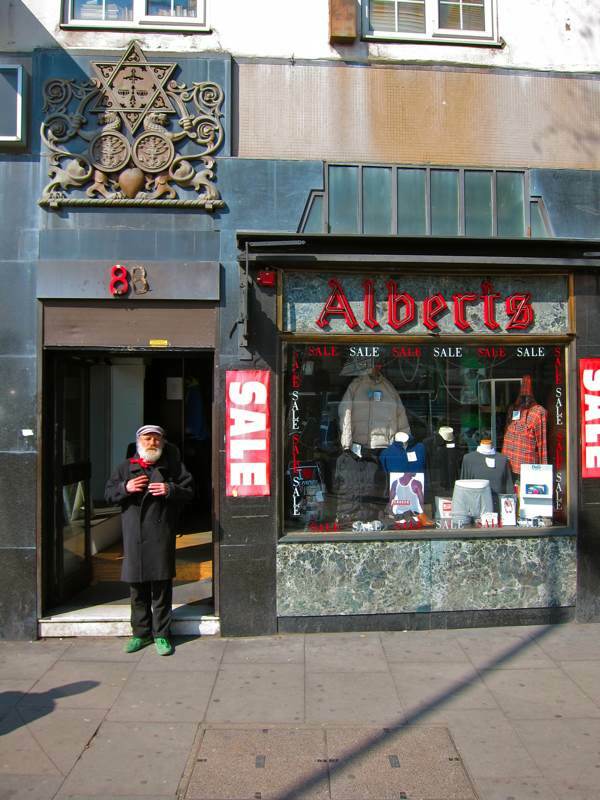 I’d like to know more about the Star of David coat of arms at 88 Whitechapel High Street. Yes, I also noticed the Star of David above the door at no. 88. Interesting. Maybe it once was a synagogue. This link explains the Star of David at no 88.